The Kegco K199B-1P Premium Kit Kegerator improves upon Kegco's already popular K199 full size keg beer dispenser by adding a premium direct draw kit for D system domestic kegs, providing premium components at an excellent value! The premium direct draw kit includes 100% stainless steel contact with a stainless steel keg coupler probe, tower, shank, faucet, and fittings, ensuring your beer will only touch sanitary stainless steel and food grade plastic from the keg to your glass! The draft tower is also made of durable stainless steel, so it will not rust over time. For even more value, Kegco has included a double gauge regulator upgrade, a heavy duty faucet wrench, and a deluxe hand pump pressurized cleaning kit. These upgrades would normally cost over $240, so you are getting a value of over $190 by purchasing this premium kit kegerator! Kegco's K199B-1P Premium Kegerator still boasts all of the same great features that you've come to love in the K199 Series, including a stainless steel interior floor mat for long-lasting durability, a textured serving countertop, and an attractive metal safety rail that helps prevent your mugs and glasses from sliding off. 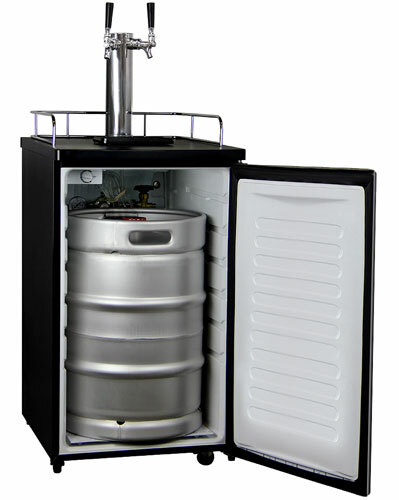 Your kegs are housed in an all-black cabinet with an elegantly designed field reversible black door that can be easily moved from room to room thanks to the 2-1/2" casters. Designed for home use, this kegerator is quiet and energy efficient and comes with 2 removable wire shelves that give you the option to use it as an all-refrigerator or beverage center when you're not dispensing kegs. As well as the premium upgrades, the dispense system also comes with everything else you'll need to begin dispensing beer kegs, including an empty 5 lb. aluminum CO2 tank that can dispense approximately 5-6 full size kegs once filled, a Sankey keg coupler that is compatible with most domestic beer kegs, a gas hose, beer tubing, washer, and clamps.